Although Croatia developed under the impact of many different cultures, it gave its own and unique imprint to the history of European civilization. Croatia was occupied by the Romans, Illyrians, and Slavic tribes. All have left their mark on the country's development and culture. At the end of WW2, Croatia became a republic ruled by the Communist Marshal Tito. In 1980, when Tito died, a new political system governed the country, which resulted in a crash in the Croatian Economy. Like other Western European countries, Croatia was founded on the ruins of the Roman Empire. Croatia is indeed unique, not only for its crystal, clear blue sea, but also for a thousand years of different cultures. The Croats are believed to be purely Slavic people who migrated from Ukraine and settled in present-day Croatia during the 6th century. Croatia is bounded by Slovenia in the northwest, by Hungary in the northeast, by Serbia and Montenegro in the east, by Bosnia and Herzegovina in the south, and by the Adriatic Sea in the west. The Adriatic Sea is not only a deep gulf in the Mediterranean, it is also known as the cradle of ancient civilization. 400BC The first Greek colonies are founded on Adriatic islands. 100BC Romans rule over the east coast of the Adriatic. 295. Diocletian, Roman Emperor, began the construction of a fortified palace near the village of his birth. It later became the historic downtown of Split, Croatia. Construction took ten years. 614. 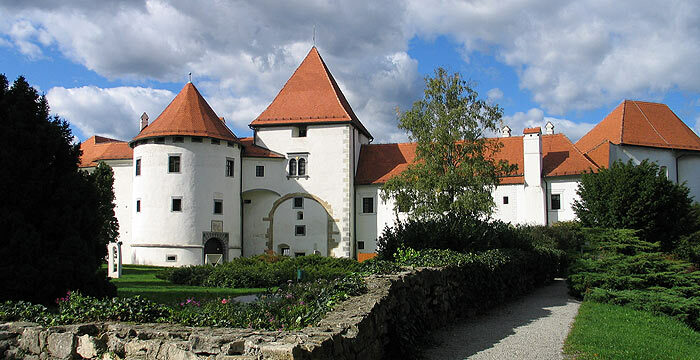 Croats settled in the area between the Adriatic Sea and the rivers Sava and Drava. 925. The Croatian kingdom was established. King Tomislav was crowned first king of Croatia by decree of the Holy Catholic church in Rome, and was its founder. 1102. After the death of Petar Svacic, the last Croatian king, Croatia enters into a union with Hungary. 1847. Croatian becomes the official language of Croatia, replacing the Latin language. 1918. After the downfall of the Austro-Hungarian Monarchy in World War I, Croatia becomes part of the Kingdom of Serbs, Croats, and Slovenes, later proclaimed Yugoslavia. 1929. The Monarchy's name is changed to Yugoslavia. 1941. German and Italian forces occupy Yugoslavia, the organized partisan resistance starts, led by Croatian antifascists under the guidance of Josip Broz Tito. 1945. After World War II, the monarchy becomes a communist republic under prime minister Tito. 1980. Tito's tight reign on Yugoslavia keeps ethnic tensions in check until his death in 1980. Without his Slavic influence, ethnic and nationalist differences begin to flare. 1981. Young locals in Medjugorje, Croatia, believed that the Virgin Mary was making regular monthly appearances. 1990. Election of the first Croatian president, Franjo Tuđman. 2001. Stipe Mesic was elected president of Croatia.